Amblyopia refers to diminished vision in either one or both eyes, for which no cause can be discovered upon examination of the eye. Amblyopia is the medical term used when the vision in one of the eyes is reduced because the eye and the brain are not working together properly. The eye itself looks normal, but it is not being used normally because the brain is favoring the other eye. This condition is also sometimes called lazy eye. Lazy eye is a common non-medical term used to describe amblyopia because the eye with poorer vision does not seem to be doing its job of seeing. Amblyopia is the most common cause of impaired vision in childhood. It affects approximately two or three out of every 100 children. Vision is a combination of the clarity of the images of the eyes (visual acuity) and the processing of those images by the brain. If the images produced by the two eyes are substantially different, the brain may not be able to fuse the images. Instead of seeing two different images or double vision (diplopia), the brain suppresses the blurrier image. This suppression can lead to amblyopia. During the first few years of life, preferring one eye over the other may lead to poor visual development in the blurrier eye. Unless it is treated successfully in early childhood, amblyopia usually persists into adulthood and is the most frequent cause of monocular (one eye) visual impairment among children. The prevalence of amblyopia is difficult to assess, with estimates ranging from 1.0 to 3.5 percent in healthy children to 4.0 to 5.3 percent in children with other vision problems. It is seen in similar numbers in both sexes and in all races. Strabismus . A misalignment of the eyes is the most common cause of functional amblyopia. The two eyes are looking in two different directions at the same time. The eyes may turn in, out, up, or down. Strabismus may be diagnosed at birth, or it may develop later in childhood. The brain is sent two different images and this creates confusion. Images from the misaligned or "crossed" eye are turned off to avoid double vision. Anisometropia. A difference of refractive states exists between the two eyes (in other words, a difference in prescription between the two eyes). For example, one eye may be more nearsighted than the other eye, or one eye may be farsighted and the other eye nearsighted. Because the brain cannot fuse the two images, the brain suppresses the blurrier image, causing the eye to become amblyopic. Cataract. Clouding of the lens of the eye causes the image to be blurrier than the other eye. The brain prefers the clearer image, and the eye with the cataract may become amblyopic. Ptosis. If light cannot enter the eye because of the drooping lid, the eye is essentially going unused, which can lead to amblyopia. However, ptosis is rarely related to the development of amblyopia, unless the droopy eyelid completely obscures the pupil. Barring the presence of strabismus or ptosis, children may or may not show signs of amblyopia. Children may position their heads at an angle while trying to favor the eye with normal vision. They may have difficulty seeing or reaching for things when approached from the side of the amblyopic eye. Parents should see if one side of approach is preferred by the child or infant. If an infant's good eye is covered, the child may cry. Parents should call the doctor if their child demonstrates any signs associated with amblyopia, including the appearance of crossed eyes, lazy eye, a drooping eyelid, difficulty seeing, or if the child seems to favor one side of approach over the other. However, since children do not always show symptoms of amblyopia, it is important to get their eyes examined at or before the age of three and no later than age five, while the disorder is more easily treated. It is not easy to recognize amblyopia. A child may not be aware of having one strong eye and one weak eye. Unless the child has a misaligned eye or other obvious abnormality, there is often no way for parents to tell that something is wrong. Because children with outwardly normal eyes may have amblyopia, it is important to have regular vision screenings performed for all children. While there is some disagreement regarding the age children should have their first vision examination, their eyes can, in actuality, be examined at any age, even on the first day of life. Some people recommend that children have their vision checked by their pediatrician, family physician, ophthalmologist, or optometrist at or before six months of age. Others recommend testing by at least the child's fourth birthday. There may be a critical period in the development of vision, and amblyopia may not be treatable after age eight or nine. The earlier amblyopia is found, the better chance there is for a positive outcome. Most physicians test vision as part of a child's medical examination. If there is any sign of an eye problem, they may refer a child to an eye specialist. There are objective methods, such as retinoscopy, by which to measure the refractive status of the eyes. This form of examination can help diagnose anisometropia. In retinoscopy, a hand-held instrument is used to shine a light in the child's (or infant's) eyes. While the doctor uses hand-held lenses, he can obtain a rough prescription. Visual acuity can be determined using a variety of methods. Many different eye charts are available (e.g. tumbling E, pictures, or letters). In amblyopia, single letters are easier to recognize than when a whole line is shown. This is referred to as the "crowding effect" and helps in diagnosing amblyopia. Neutral density filters may also be held over the eye to aid in the diagnosis. Sometimes visual fields to determine defects in the area of vision will be performed. Color vision testing may also be done. Again, it must be emphasized that amblyopia is a diagnosis of exclusion. 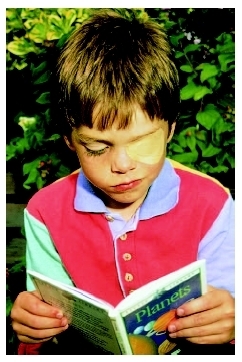 Boy wearing eye patch used to treat amblyopia. The patch is worn over the stronger eye to build the weaker one's strength. Various medical problems can also cause a decrease in vision. An examination of the eyes and visual system is very important when there is an unexplained decrease in vision. Amblyopia treatment is most effective when done early in the child's life, usually before age seven. It is important that any anisometropia and refractive problems be treated initially, because sometimes amblyopia can be resolved with glasses alone. Patching. An opaque, adhesive patch is worn over the stronger eye for weeks to months. This therapy forces the child to use the eye with amblyopia. Patching stimulates vision in the weaker eye and aids the section of the brain that manages vision to develop more completely. Patching may be part-time or full-time. Studies in the early 2000s have shown that less time patching the eye may be as effective as more. In the case of moderate amblyopia, two hours of daily patching for four months gave the same benefit as six hours of daily patching for the same period of time. Compliance with the patching regimen was also improved with the shorter daily patching time. The treatment plan should be discussed with the doctor to determine how long the patch should be worn. When the child is wearing the patch, prescribed eye exercises may force the amblyopic eye to focus and work. This is called vision therapy or vision training. Even after the child's vision has been restored in the weak eye, part-time patching may be required over a period of years to maintain the improvement. Atropine. This therapy is generally reserved for children who will not wear a patch or where compliance may be an issue. A drop of a drug called atropine is placed in the stronger eye once a day to temporarily blur the vision so that the child will prefer to use the eye with amblyopia. Treatment with atropine also stimulates vision in the weaker eye and helps the part of the brain that manages vision to develop more fully. The younger the child, the better the chance for improvement with occlusion and vision therapy. Success in the treatment of amblyopia also depends on the amblyopia's severity, its specific type, and the child's compliance with treatment. It is important to diagnose and treat amblyopia early because significant vision loss can occur if it is left untreated. The best outcomes result from early diagnosis and treatment. Early recognition and treatment of amblyopia in children can help to prevent permanent visual deficits. All children should have a complete eye examination at least once between age three and five to avoid the risk of allowing unsuspected amblyopia to go beyond the age where it can be treated successfully. There are some rarer forms of amblyopia caused by various nutritional deficiencies. In these cases, the doctor recommends the proper diet and perhaps supplementation in order to resolve the problem. It is vital that parents bring their child for an eye exam sometime between the ages of three and five to prevent amblyopia from becoming untreatable. Anisometropia —An eye condition in which there is an inequality of vision between the two eyes. There may be unequal amounts of nearsightedness, farsightedness, or astigmatism, so that one eye will be in focus while the other will not. Cataract —A condition in which the lens of the eye turns cloudy and interferes with vision. Occulsion therapy —A type of treatment for amblyopia in which the good eye is patched for a period of time, thus forcing the use of the weaker eye. Visual acuity —Sharpness or clearness of vision. Barber, Anne. Infant and Toddler Strabismus and Amblyopia, Vol. 41, No. 2: Behavioral Aspects of Vision Care. Santa Ana, CA: Optometric Extension Program Foundation, 2000. Fielder, Alistair, et al. Amblyopia: A Multidisciplinary Approach. Kent, UK: Elsevier—Health Sciences Division, 2002. Pratt-Johnson, John A., et al. Management of Strabismus and Amblyopia: A Practical Guide. New York: Thieme Medical Publishers, 2000. Dutton, Gordon N., and Marie Cleary. "Should We Be Screening for and Treating Amblyopia? Evidence Shows Some Benefit." British Medical Journal 327, no. 7426 (November 29, 2003): 1242–44. Finn, Robert. "Less Patching Fine for Amblyopia in Young Children: Two Studies." Family Practice News 34, no. 9 (May 1, 2004): 70–71. American Association for Pediatric Ophthalmology and Strabismus. PO Box 193832, San Francisco, CA 94119–3832. Web site: http://www.aapos.org. National Eye Institute. 31 Center Drive MSC 2510, Bethesda, MD 20892–2510. Web site: http://www.nei.nih.gov. Prevent Blindness America. 500 E. Remington Road, Schaumburg, IL 60173. Web site: http://www.preventblindness.org. "Amblyopia." National Eye Institute , June 2004. Available online at http://www.nei.nih.gov/health/amblyopia (October 16, 2004).